Dr. Christopher Segler, a San Francisco-based sports medicine podiatrist and foot surgeon ran the China Camp Challenge half marathon trail race on Saturday February 7, 2015. The race was set on the trails in the China camp state park in San Rafael California. This was an inaugural event put on by Urban Coyote Racing. He says the conditions were good because although it was projected to be raining all morning, the day was clear. Recent rain meant that the trails were wet and muddy which made for lots of slipping and sliding and potential for ankle sprains but apparently there were not any foot or ankle injuries during the race. 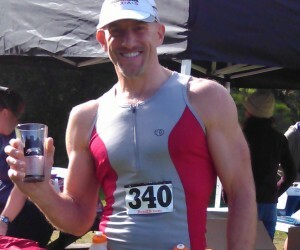 Dr. Segler completed the hilly trail half marathon course 1 hour and 57 minutes, which was fast enough to take first place in the 40 to 49 age category. Dr. Segler said that trail running is one of the best ways to train for a marathon or long course event because the changing topography and irregular running surface works core stability and supporting muscle groups of the foot and ankle that are not normally stressed during long course road running events like marathons and Ironman triathlons. Dr. Segler currently training for Ironman Texas and will be competing in the Ironman Triathlon World championships in Kona, Hawaii in October 2015.